Imagine being in China without a camera. I wasn't feeling too happy at the prospect of this. Fortunately my other half was meeting me here and brought an old lens here for me to use. Not ideal but I am happy to be taking pictures again. I can now post a couple of postcards until I return to London. Oh and it is my birthday today. Love your pictures! It makes me want to be there! happy birthday!! hope you're having fun on this side of the world! Happy B-Day, Mo. 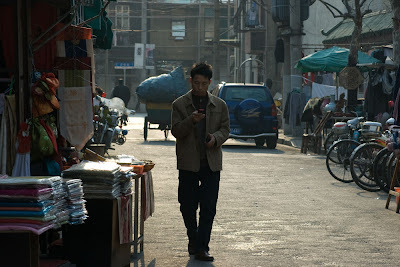 No grey market photog equipment to be had in Shanghai? I love the photo, the car looks antiquish in the small frame. Happy birthday, your pics are so beautiful. Happy Birthday Mo, have a fabulous one! Shanghai is a great city.. happy traveling. Happy birthday! Oddly enough I know someone else celebrating a birthday today as well. Hope you enjoy Shanghai! Any chance you'll be passing my Hong Kong? Great shot! And Happy birthday! Happy birthday! Have just started reading Shanghai Baby - would love to see the place I'm reading about! Thanks for the photo. Glad you got a replacement lens. This image is just so Asian! You'll see it a lot here too. Well, except for the bikes. Happy birthday! Hope you have a great time wherever you are right now! Love the photo and Happy Birthday! About the photo: it has an atmosphere of its own, no doubt about it! Enjoy the trip and take plenty of pictures! Happy birthday! Lovely picture, once again! Happy birthday! (Sorry, one day late.) I'm happy you were "saved"! Happy birthday - enjoy China! I can sincerely tell you that this is one awesome blog. Keep up the good work! Happy belated birthday beautiful stranger.